While some PC makers are nervous about building hardware for Windows RT, Samsung's going for it with the Samsung Ativ Tab. Will it be enough to steer people away from Microsoft Surface? 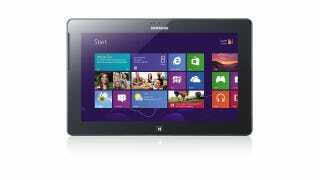 The Ativ Tab has 10.1-inch 1366x768 display, is 8.9mm thick, and weighs 20 ounces. So it's slimmer and lighter than the last Samsung Galaxy Tab. Its specs are actually superior to the Tab in nearly every way when you consider the 1.5 GHz dual-core processor, 2 gigabytes of RAM, and either 32 or 64 gigs of storage. Besides the obvious, Bluetooth 4.0 and Wi-Fi connectivity, the Ativ Tab also has NFC and GPS chips as well as USB 2.0 and mini-HDMI ports. We'd never encourage anyone to take the photos with a tablet, but the the Ativ Tab comes with a 5-megapixel rear-facing camera and a 1.9-megapixel camera in front for video chat and gross self-portraits. No word on pricing or availability, but count on it sometime around the official release of Windows 8 in October.